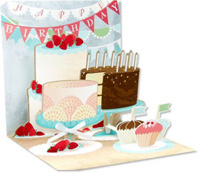 Shop for name brand birthday cards from our awesome selection of cards that includes great name brands like Avanti, Paper House, Pictura, Freedom Greetings and Marian Heath. 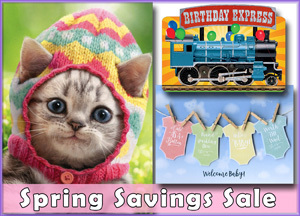 With dozens of brands and thousands of designs to choose from, you'll find an incredible assortment while shopping in our birthday card department. 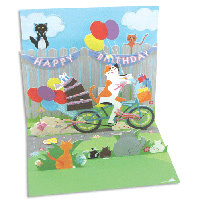 Mail the cards to yourself for hand delivery or you have the option to add a personal message to the interior of the birthday card and we'll mail it directly to your family and friends. Front: Bakery - See inside for specials! 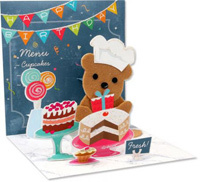 More Info: Create smiles with this ultra-cute birthday card that features a fuzzy bear holding a present while surrounded by treats. Just open the card and multiple layers of images pop up! Write your message on the back of the card. Extra postage required. 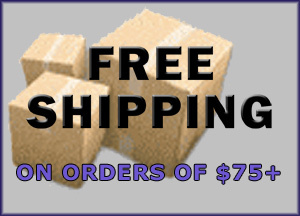 More Info: Write your message on the back of the card. 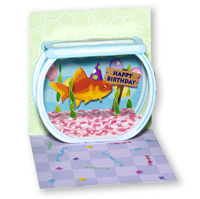 Personalize this card with one of the enclosed message tags. 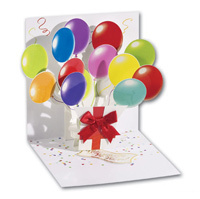 Message tags included with this card: Happy Birthday!, Congratulations!, I Love You, Celebrate!, Surprise!, and one blank tag. Extra postage required. 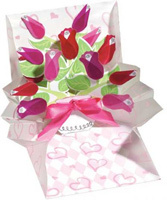 More Info: Chocolate frosted angel food and strawberry covered cakes pop up when this wonderful birthday card is opened. Write your message on the back of the card. Extra postage required. 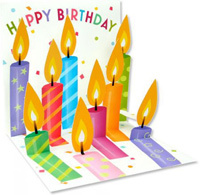 More Info: Sparkling glitter shimmers on the candle flames as each one springs up and out of the card. Write your message on the back of the card. Extra postage required. 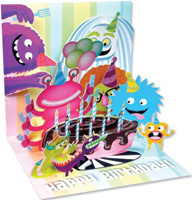 More Info: Who wouldn't smile when they see this great 3-dimensional birthday card that features over 8 pop-up layers of cute monsters as they prepare to devour the birthday cake! Write your message on the back of the card. Extra postage required. Inside: Happy Birth - Day! 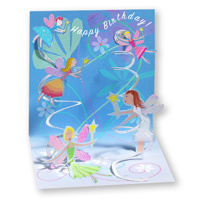 More Info: Silver holographic foil enhances 3 layers of illustrations that pop up to say Happy Birthday! Write your message on the back of the card. Extra postage required. More Info: Write your message on the back of the card. 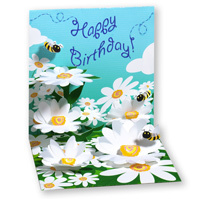 Personalize this card with one of the enclosed message tags. Message tags included with this card: Happy Birthday!, Happy Valentine's Day!, I Love You, Thinking of You, Thank You, and one blank tag. Extra postage required. 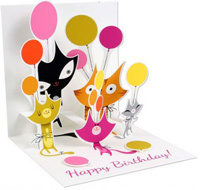 More Info: Say happy birthday with this super cute card that features five 'pop-up' colorful cats and balloons. Write your message on the back of the card. Extra postage required. 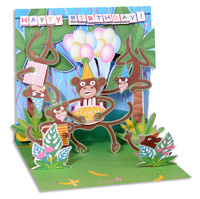 More Info: Sparkling frosting covers the cupcakes on this unique 3-dimensional pop-up greeting card. 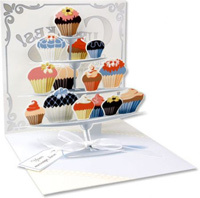 Just open the card and the multi-tiered silver foil serving trays display an array of delicious cupcakes. Write your message on the back of the card. 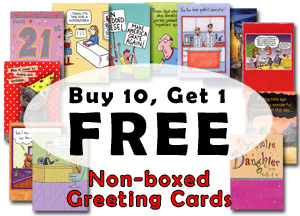 Personalize this card with one of the enclosed message tags. 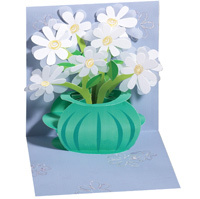 Message tags included with this card: Happy Mother's Day, Happy Birthday, Congratulations, and one blank tag. Extra postage required. More Info: Write your message on the back of the card. 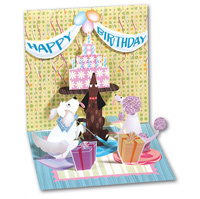 Personalize this card with one of the enclosed message tags. Message tags included with this card: Happy Mother's Day!, Happy Birthday!, Thank You, Thinking of You, Feel Better, and one blank tag. Extra postage required. 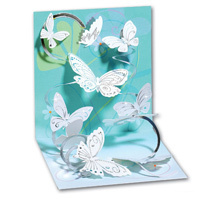 More Info: Silver holographic foil shimmers on the dragonfly wings and the images pop out as the card is opened. Write your message on the back of the card. 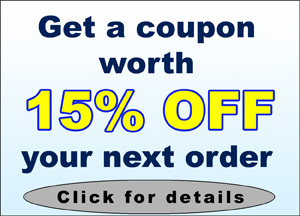 Personalize this card with one of the enclosed message tags. Message tags included with this card: Thank You, Happy Birthday, Feel Better Soon, Happy Mother's Day, and one blank tag. Extra postage required. More Info: Write your message on the back of the card. 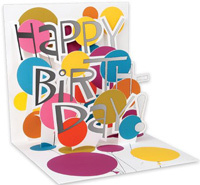 Personalize this card with one of the enclosed message tags. 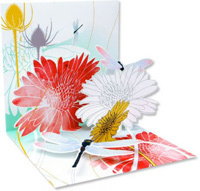 Message tags included with this card: Happy Mother's Day!, Thinking of You, Thank You, Get Well!, Happy Birthday!, and one blank tag. Extra postage required. 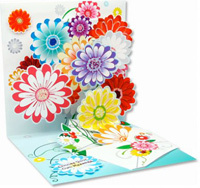 More Info: Layers of colorful, sparkling flowers highlight this wonderful pop-up greeting card. Write your message on the back of the card. 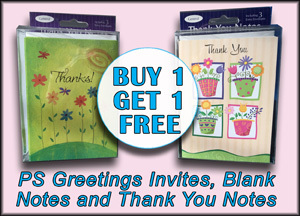 Personalize this card with one of the enclosed message tags. Message tags included with this card: Happy Mother's Day, Happy Birthday, Get Well Soon, Thinking of You, and one blank tag. Extra postage required.